Cardholder Benefits: $60.00 (plus tax) GREEN FEE for Cardholder (Include.. Unlimited Golf with Golf Cart & Range and More! Cardholder Benefits: ..
Cardholder Benefits: Buy & Receive a minimum of (20) 18-Hole Golf Gi..
Cardholder Benefits: UNLIMITED RANGE BALLS (up to 1 hour per day per car..
Cardholder Benefits: UNLIMITED RANGE BALLS (up to 1 per day) Unlimited .. 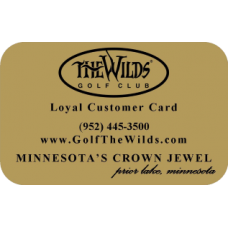 The Wilds Pub Card is perfect for "on the go" families who enjoy dining out..